Google has responded to Microsoft’s bid to takeover Yahoo. David Drummond, Senior Vice President, Corporate Development and Chief Legal Officer for Google has posted a response on the Official Google Blog, and they’re not happy. According to David, Microsoft’s hostile bid for Yahoo! raises troubling questions. This is about more than simply a financial transaction, one company taking over another. It’s about preserving the underlying principles of the Internet: openness and innovation. Could it also be that Google sees the merging of these two companies as a threat to the dominance they now exert over the Web? 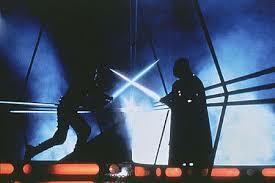 I don’t know if we’re seeing a Luke Skywalker vs Darth Vader battle here, or if there are any bad guys at all. What will be interesting is what could possibly happen if Microsoft is successful. No doubt new tools to play with and a Google fightback. Interesting times we live in. Thanks to Download Squad and Phil Bradley for alerts to this post. *For those who read my previous post -pleased to report car keys found by kind citizen and returned to me today. To Lynne, who did the good deed and refused a reward for her kindness, my hope is that karma comes around and serves you well. Next PostNext Frozen Grand Central – Brilliant!